Because I'm not going to a Halloween party, this beer geek is going to spend his Saturday night with a couple India Pale Ales. One is Anderson Valley Hop Ottin' which I consider to be and "old school" west coast IPA and the other Lagunitas IPA, what I consider to be "new school." First up is the Anderson Valley, which pours beautifully with plenty of carbonation that settles to a quarter-inch thick head with lots of Brussels lace. Hop aroma is a little restrained; but a good amount of complex hop flavor is present, with a good dose of peppery, citrusy hops and resiny bitterness in the finish. Very smooth. Caramel malts do well in balancing this IPA, until it warms up and the last sip is quite bitter! The Lagunitas IPA is much more refined; less rustic I suppose. It appears to have been more tightly filtered. It pours with even more carbonation than the Hop Ottin' which creates some lace (though not as thick), but lacks head retention. The Lagunitas smells different; it's citrus, but particularly orange. Very smooth and dry enhancing quaffability which fits the brewery's motto of "life is short, don't sip!" I enjoyed both of these beers, but I think I liked the Hop Ottin' a little more. 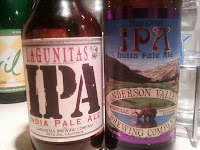 The Lagunitas was easy to quaff, but I enjoyed the complexity of the Anderson Vally IPA a little more. I should probably mention (as I have on Twitter) that I brewed a Brewer's Best kit from LD Carlson about a week ago. I decided to brew an IPA at the last minute on a Sunday and the only homebrew shop that I know of that was open in my area didn't have all the ingredients for the recipe I had created. I really wanted to get a brew going (because I had the time, which seems harder to come by these days) so I went with a Brewer's Best India Pale Ale kit. I've brewed a few of these kits before and I've always been pleased with the quality. I liked that the recipe included Victory malt and Columbus and Cascade hops. I actually used some of the aroma hops (Cascades) earlier in the boil to extract more bitterness. I racked to the secondary yesterday and it seems that my adjusting the hops may have been a good choice as the hop character was a little more assertive than I expected. I could totally pick up on the toasted character of the Victory malt, too. I modified the recipe further by dry hopping with a little more than two ounces of Simcoe hops, which should hopefully add a little more hop spice up front in this brew. I plan on leaving the beer in the secondary as long as it takes for the hops to settle out. The waiting will be hard. Who says getting old is no fun? 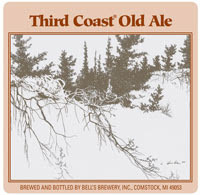 I wasn't going to have any beer tonight, but I felt like having a night cap and succumbed to a bottle of Bell's Third Coast Old Ale that's been sitting in my basement and was bottled on September 5, 2008. This Third Coast Ale is hard to describe. It is a very malt-forward beer, but still manages to have a surprisingly assertive hop character for its age (at least towards the finish.) The flavor of massive amounts of caramel malts mingle quite well with the woody, earthy hops and it makes me wonder if Bell's added massive amounts of Kent Goldings to this brew. There's toffee and burnt caramel flavors that get slightly astringent, before a peppery bitter finish that is supported by more malt. As this beer warms up its complexity gets a little easier to pin down; marzipan and apricot flavors emerge with just a hint of tobacco in the aftertaste. Awhile back I learned that Bateman's Ales had returned to our shores. I was quite happy about this as I have some fond memories of drinking Bateman's back in the 1990s. My interest in Bateman's came about after watching the British episode of Michael Jackson's Beer Hunter series produced by the Discovery Channel. Jackson interviewed George Bateman who was a bit emotional while relating the story about saving the brewery. Whilst getting rather choked up, he told Jackson about "old age pensioners" sending him "10-pound notes to help save the brewery." Mr. George (as he was known) was quite a character in this video and piqued my interest in the brewery. I can't remember exactly when I first tried a Bateman's ale, but when I saw them at the store I had to try them. At the time, the XXXB and the Victory Ale were available. I grew to like these beers so much that I bought a mixed case of pints of both of them for something around $15 to $18 back in 1996 (a heck of a deal, even then) for a fall weekend trip to Michigan with a good friend. (We even brought Imperial pint glass with us -- such geeks!) We drank most of the case that weekend and since then I've associated Bateman's with the fall season. It seems fitting then that today I found Bateman's at Binny's (was Sam's, but that's another story) in Downers Grove. I picked up a bottle of XXXB and Combined Harvest. 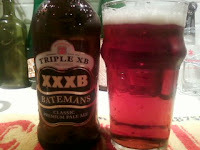 The XXXB tasted just like I remember: a fairly pronounced toffee flavor combined with a complex fruitiness leading to a dry finish spiked with a bit of mineral-like character. The hop character is a modest (by a American standards) 38 IBUs and is balanced well with the malt. The alcohol content by volume is 4.8 percent. It's not quite as red as in the picture, if fact I didn't think it was really that red at all. The Combined Harvest is a new multi-grain product. The label calls it a "bronze pale beer brewed with pale and crystal barley malts combined with malted wheat, oats and rye and hopped with Phoenix and Target varities (hops)." The bottle mentions the "superb aroma", but I found the smell of Combined Harvest to be a bit lackluster. Perhaps this has to do with the voyage from England? However, I did enjoy the taste of this beer and I like its graininess and tart fruitiness. I suppose it should be noted that the brewery states that this beer is "vegan friendly." A new marketing angle? I think both of these Bateman beers are fine examples of English ale. They have plenty of flavor couple with a low alcohol content that allows the drinker to enjoy of few of these pints without any effects the next day. The seem a touch expensive though at $4.79 for a pint bottle. That said, I'm hoping I see a keg or cask show up in the Chicago area soon! Not much brewing has been going on in the past couple of months as made evident by my lack of updates here. Most of the updates of what and where I've been drinking have been posted to my Twitter account. I guess it's easier to post to Twitter than an "old-fashioned" blog. The speed of life I suppose. I did manage to brew about a month ago. I bought some concentrated cherry juice and decided to brew a cherry stout. This is something I've done off and on for a few years. I get cherry juice from a farm stand in Northern Michigan every other year or so and I usually add it to stout. Last year I made a Cherry Saison (which I still have in bottles), but this year it's back to the stout. 1.00 oz. Spalter Select Pellets 6.20 AA for 60 min. 0.50 oz. Spalter Select Pellets 6.20 AA 5.7 for 30 min. 0.50 oz. Spalter Select Pellets 6.20 AA 1.9 for 5 min.